How do I disable Diffie-Hellman Key Exchange in IIS (Windows web server)? 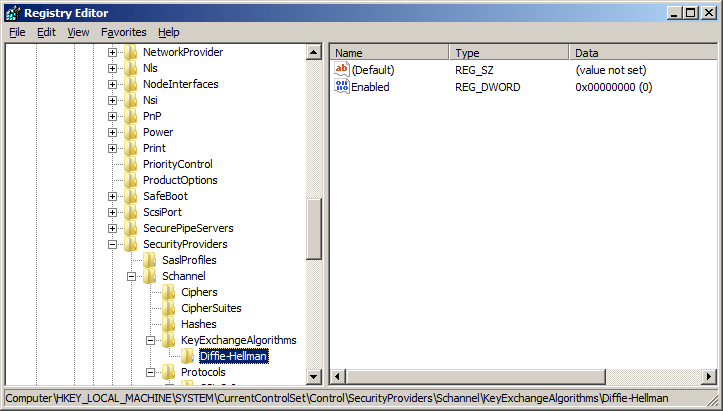 To control key exchange algorithms and protocols, you can set values in the Windows Registry. Caution: As always, take due care when editing the Registry. Trustwave recommends that you back up the Registry before making any changes. The settings provided below are for information only. You should confirm the applicability to your environment. By default, Diffie-Hellman key exchange is enabled. The procedures to disable the algorithm are slightly more complex due to differences in the Registry structure. When you disable any algorithm, you disallow all cipher suites that use that algorithm. Article has been viewed 22,249 times.